Fortech has been recognized among top 9 best performing companies in Transylvania, at the 6th edition of the “Business Champions” Conference. 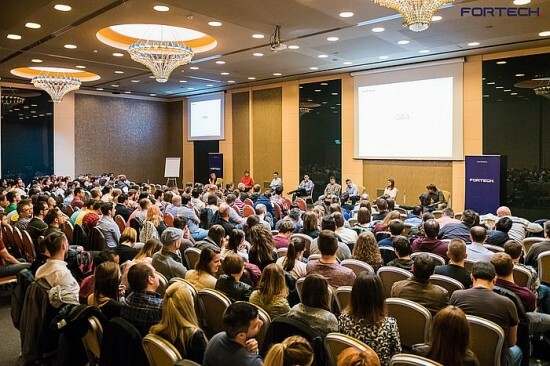 The event took place in Cluj Napoca at the beginning of November in the presence of local entrepreneurs, banking, analysts and business consultancy representants. Following an assessment of the IT scenery from Transylvania region, the Business Champions jury awarded local companies for their evolution and performance. The award is based on the incremental growth in terms of employees and annual turnover evolution. They also considered the contribution each company brings to the local and regional business community. The trophies were awarded by the project partners: Enterprise Investors, BCR banking, PwC Romania and the Triple Helix Association. Business Champions is a program that discovers, promotes and awards the most dynamic Romanian entrepreneurs who create jobs, add value through innovation and bring a significant contribution to the local market. said Calin Vaduva, Fortech CEO. The regional technology space is extremely dynamic, with several software players attempting to find their place and achieve stability and sustainable growth in a maturing market. Fortech only has been involved in more than 150 projects and created over 600 tech jobs, contributing to the economic development of the region. In the last years, the company has seen an accelerated growth rate both in terms of projects and employees and is on track to close the current year with more than 20 million Euro. 2016 opened the opportunity to expand its offering to new markets, mainly in Sweden, Holland and Israel, while preserving the relationships with clients from Germany and USA. Focused on team consolidation, it also expanded its operations in the north-eastern and western regions of Romania, opening there 3 offices which counts today over 50 employees. Checking all important data point, including: the genuine capacity to understand customers’ challenges and expectations, strong software expertise, refined processes and also the capacity to scale fast, Fortech is able today to fully cover client needs globally.